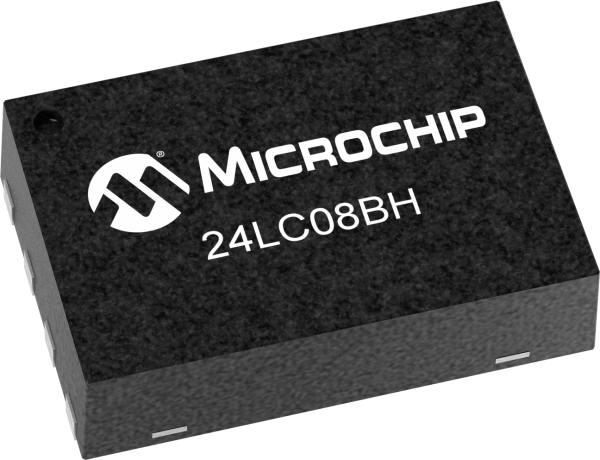 The Microchip Technology Inc. 24LC08BH is a 8Kb I2C™ compatible Serial EEPROM with half array write protection. The device is organized as four blocks of 256 x 8-bitmemory with a 2-wire serial interface. Low-voltage design permits operation down to 2.5V, with standby and active currents of only 1 µA and 1 mA,respectively. The 24LC08BH also has a page write capability for up to 16 bytes of data. The 24LC08BH is available in the standard 8-pin PDIP, surface mount SOIC, TSSOP, 2x3 TDFN and MSOP packages, and is also available in the 5-lead SOT-23 package. All packages are Pb-free and RoHS compliant.